Reproducible software deployment for high-performance computing. In the quest for truly reproducible workflows I set out to create an example of a reproducible workflow using GNU Guix, IPFS, and CWL. GNU Guix provides content-addressable, reproducible, and verifiable software deployment. IPFS provides content-addressable storage, and CWL describes workflows that can run on specifically supported backend hardware system. In principle, this combination of tools should be enough to provide reproducibility with provenance and improved security. Note: this work was mostly executed during the Biohackathon 2018 in Matsue, Japan. The Common Workflow Language (CWL) is a specification for describing analysis workflows and tools in a way that makes them portable and scalable across a variety of software and hardware environments—from workstations, to clusters, to “the cloud”, and to secure high performance computing (HPC) environments. CWL is designed to meet the needs of data-intensive sciences, such as bio- and medical informatics, imaging, astronomy, physics, and chemistry. CWL started as an answer to problems associated with ad hoc pipeline scripts in bioinformatics, and the acute need to come up with reliable, modular, and well documented solutions. The CWL promises a future of far more efficient pipeline assembly and use, building on components others have created and tested. The objectives of CWL are now more important than ever, especially given the reproducibility crisis. Many important publications cannot be reproduced using source data and the reported workflow. These problems are also highlighted in Experimenting with reproducibility: a case study of robustness in bioinformatics and in PiGx: reproducible genomics analysis pipelines with GNU Guix. CWL definitions are comparatively simple once you understand that responsibilities are split into three components: data inputs (“Jobs” in CWL parlance) are separate from software inputs (aka. “Tools”) and software inputs are split from the workflow definition (fortunately known as “Workflows”). The InterPlanetary File System is a protocol and network designed to create a content-addressable, peer-to-peer method of storing and sharing hypermedia in a distributed file system. IPFS provides a way of connecting different data sources and sites together (say from different institutes), and can locate and serve files in a (reasonably) scalable manner. IPFS is content-addressable (more on this below) and allows for deduplication, local caching, and swarm-like software downloads over the network. IPFS is free software and available through GNU Guix. GNU Guix is the package manager of the GNU Project. The Guix project originated from the work done on the Nix package manager. There are some misconceptions here. In a way, Guix is to Nix what LDC is to Clang: both use the same low-level mechanisms (build daemon, LLVM), both share the same functional paradigm of software deployment, but the rest of the implementation and philosophy is different. There is no anymosity between the projects and they still share work and ideas. Both packagers give full control over the software dependency graph and aim for software deployment done right with killer features, such as non-interference/isolation of software packages, easy roll-backs, light-weight containers etc. etc. Today, GNU Guix (heading for 1.0 release) is a substantial project with its own unique packaging system and related tools and with hundreds of committers and roughly 9,000 packages including a wide range of bioinformatics packages. GNU Guix can be deployed on any existing Linux distribution without interference (I use Debian) and provides rigorous and robust control of the dependency graph. We deploy some massively complicated software deployments using development, testing, staging and production environments with and without containers. Because of GNU Guix I can sleep at night :). A hash value is computed over the fastq file and becomes part of the reference. If the file contents change in any way, even a single letter, the hash value changes, and therefore the reference. This property guarantees you are always dealing with the same input data - a key property of any reproducible pipeline. There can be no ambiguity about file names and what they represent. Files cannot change without the file name changing. If the source code or configuration changes the hash will change and the software is installed independently/isolated in its own path. This means you can easily run multiple versions of the software on Guix. A true reproducible pipeline includes a unique reference to the binary tool(s). It is even better than that because all dependencies are included in the hash. Therefore the software dependency tree is carved in stone and one can recover and draw the dependency graph as shown below. This may appear a bit involved, but the good news is that most of these references are transparent. The Guix environment deals with resolving them as should become clear. The first step is to install the Guix. Guix allows regular users to install software packages on any Linux distribution (Debian, Fedora, and CentOS are all fine). Again, GNU Guix does not interfere with running the Linux distribution. In fact, you can remove all of GNU Guix at any time by removing two directories (/gnu and /var/guix). So, you do not have to worry about messing up your Linux system! An install script can be run on the command line. That is the easy option. More installation instructions are here at GitLab and here at GNU.org. The short of it is that the Guix (daemon) needs to be installed as root, but runs with user land privileges. For those who cannot get access to root there are workarounds, including the use of Docker. Ricardo Wurmus describes how MDC deploys GNU Guix on their HPC and here (essentially use one build host and copy files to the rest). For HPC we typically use a build host that has privileges, but all other HPC nodes simply mount one directory under /gnu/store using a network mount. More HPC blogs on this topic here. If you don't think it can be done on HPC, think again: Compute Canada deploys Nix on their HPCs (over 120,000 cores). And if you can do Nix, you can do Guix. Same principles. Note that I am setting a Guix profile in ~/opt/cwl. This profile contains symbolic links to all relevant tools installed by GNU Guix with that command. Note that the guix-cwl channel also provides a Docker image that we will update for cwltool. First, I thought to run one of the pipelines from bcbio-nextgen as an example. Bcbio conveniently generates CWL (they switched from Python scripts to CWL scripts). But then at the BH18 there was a newly created CWL pipeline in https://github.com/hacchy1983/CWL-workflows and I decided to start from there. This particular pipeline uses github to store data and a Docker container to run a JVM tool. Good challenge to replace that with IPFS and Guix and make it fully reproducible. Note that git does provide provenance but is not suitable for large data files. And even though Docker may provide reproducible binary blobs, it is quite hard to verify what is in them, i.e., there is a trust issue, and it is usually impossible to recreate them exactly—the core of the reproducibility issue. We can do better than this. In the next step we are going to make the data available through IPFS (as installed above). (note that ipfs uses quite a bit of bandwidth to talk to its peers. For that reason don't keep the daemon running on a mobile network, for example). and you should see the contents of small.chr22.fa. You can also browse to http://localhost:8080/ipfs/QmR81HRaDDvvEjnhrq5ftMF1KRtqp8MiwGzwZnsC4ch1tE on your local machine. Next you ought to pin the data so it does not get garbage collected by IPFS. Note that the package is completely defined with its dependencies and “content-addressable”. We can see it pulls in Java and Picard. Note also the software is made available under an “isolated” profile in ~/opt/cwl. We are not mixing with other software setups. And, in the end, all software installed in this profile can be hosted in a (Docker) container. Partial success. fastqc runs fine and now we hit the next issue. The /usr/local points out there is at least one problem :). There is also another issue in that the data files are specified from the source tree, e.g. Here you may start to appreciate the added value of a CWL workflow definition. By using an EDAM ontology CWL gets metadata describing the data format which can be used down the line. This would be safe because IPFS is content-addressable. The original workflow pulls trimmomatic.jar as a Docker image. Just as an example here I download the jar file and created a GNU Guix package to make it available to the workflow. Guix likes things to be built from source. This is a clear goal of the GNU project. But you can still stick in binary blobs if you want. Main thing is that they need to be available in /gnu/store to be seen at build/install time. Here I am going to show you how to do this, but keep in mind that for reproducible pipelines this is a questionable design choice. After installation the jar will be available in the profile under that directory. The GUIX_PACKAGE_PATH variable points into the workflow directory where I created the package. This workflow is broken because there are no index files! The original CWL script just assumed they were in the fadir directory. But the workflow does not automatically fetch them. So, we need to fix that. Just add them using IPFS (though we could actually recreate them using bwa index instead). @@ -6,7 +6,18 @@ fq2:  # type "File"
-ref: small.chr22  # type "string"
The source and full diff can be viewed on GitHub. GNU Guix has an option to rebuild packages multiple times and compare the results. In case there is a difference the packages cannot be considered deterministic. For example software builds may contain a time stamp at time of build. This is harmless, but who is to tell the difference is not caused by something else? This is why the Reproducible Builds project exist of which Guix is a member. To fix this we could add a step to the pipeline to filter out this field or force output to go into the same destination directory. Or tell bwa to skip the @PG field. Determinism (and reproducibility) may break when the pipeline has software that does not behave well. Some tools give different results when run using identical inputs. Unfortunately, the solution is to fix or avoid such software. Also, software may try to download inputs which can lead to different results over time, for example by including a time stamp in the output. To be stringent, it may be advisable to disable network traffic when the workflow is running. GNU Guix builds all its software without a network, i.e., after downloading the files as described in the package definition the network is switched off and the build procedure runs without network in complete isolation. This guarantees software cannot download non-deterministic material from the internet. It also guarantees no dependencies can 'bleed' in. This is why GNU Guix is called a 'functional package manager' - in the spirit of functional programming Guix does not allow for side-effects. 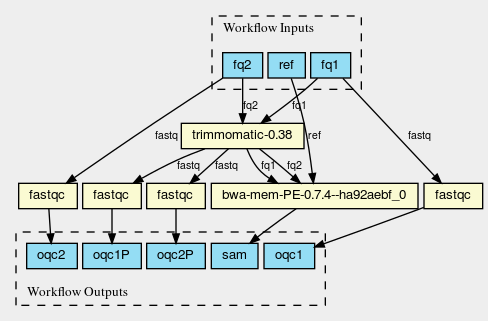 This figure shows the dependency graph for running the workflow, and includes fastqc, trimmomatic-jar, bwa, ipfs-go, and cwltool itself. This is a huge graph (but not abnormally so). GNU Guix keeps track of all these dependencies (here we show versions, but can also show the hash values) and can therefore easily display the current graph. Note that the full graph that includes all build dependencies to create the software is much larger. The trend is that most software depends on an increasing number of other software compilers, tools, libraries, and modules. To remain stress-free and sane, a rigorous way of managing resources is crucial and this is what GNU Guix provides. The figure was created by adding the workflow to the CWL viewer online (simply by pasting the github link). See https://view.commonwl.org/workflows/github.com/pjotrp/CWL-workflows/blob/guix-cwl/Workflows/test-workflow.cwl. There are two issues with the cwlviewer. First, the PNG/SVG output links do not end in .png and .svg respectively. This makes it hard to show them in a browser. Second, I could not find out how to update a view once a repo had been linked. It should be possible to update information—at least to create a new generation of workflow. I have now been informed you can only update after 24 hours… That is an odd restriction. I.e., CWL has no policy on software deployment. It is up to the user and the CWL implementation to install and find the software. The idea is that workflows and pipelines can be shared more easily when 'hard' software requirements are not specified. This shareability is, arguably, a feature. Even so, for our purpose of reproducibility, we need something more rigorous added into the mix. The CWL reference implementation handles Docker links as a 'hint' which means the CWL runner will try to fetch the image using Docker by default. Without enabling Docker (the –no-container switch), local installations of tools get preferential treatment. So, apart from downloading a separate Docker image for every tool (and every time on a HPC compute node) we also have the risk of tools 'bleeding' in from the local environment, depending on how the CWL runner is behaving/deployed. This is because software paths are not rigourously fixated in CWL scripts - it has to be handled by then environment. One way to handle this is by using a GNU Guix container. To fixate dependencies AND to ascertain no tools bleed in to our workflow from the underlying system AND to make sure we don't miss out on any dependencies we can run our workflow inside a GNU Guix container. This is not a Docker container - more on that in the next section. Let's create a container. I first had to update the Guix profile so as to use the direct store path in the new container for trimmomatic - but otherwise it works as advertised. See the output (the listed error is harmless, but I should fix it). which writes out a container that can be uploaded to docker hub or some other repo without using Docker. See also https://github.com/genenetwork/guix-cwl where we achieved exactly that. Note that a recent version of Docker itself is packaged in GNU Guix. Let's be optimisitic and assume we have all software running correctly in an isolated container created by GNU Guix and we have fetched all data as inputs from IPFS. We will then have achieved a fully reproducible pipeline that includes a CWL runner and that can be uploaded on the internet and then be run by anyone anywhere. And everything is pulled into the container. We could even make a Guix package (and therefore a container) that includes all data inputs. I will leave this as an exercise for the reader right now, but with research objects and 'live publications' the enforcement of such practices may be around the corner. In the near future we can imagine that a scientific publication is accompanied by a “live document”. I.e., the pipeline with datasets can be rerun by anyone, anywhere. And results can be reproduced and validated. With the current technology stack it can become a common requirement with journal publications. Prototypes of such live publications should appear in the coming two years. Here I show that we have the technology to make that happen. In this document I have explained some of the principle and mechanics of building a reproducible pipeline. With little effort, anyone should be able create such a pipeline using GNU Guix, an addressable data source such as IPFS, and a CWL work flow definition that includes content-addressable references to software and data inputs. By running the workflow multiple times we have asserted that the outcome is deterministic (save for hardware failure, cosmic rays, acts-of-god, and super villains) and therefore reproducible. In the process of migrating the original Docker version of this workflow it became evident that not all inputs were explicitly defined. This reproducible workflow captures the full graph, including all data, tools, and a version of the cwl-runner itself with all dependencies! There was no need to use Docker at all. In fact, this version is better than the original Docker-based pipeline because both software and data are complete, and are guaranteed to run with the same (binary) tools. To guarantee reproducibility it is necessary to fixate the inputs and have well behaved software. With rogue or badly behaved software this may be a challenge. The good news is that such behaviour is not so common and when encountered, GNU Guix and IPFS will highlight the reproducibility problems. CWL includes a range of satellite tools including cwlviewer that I used to generate the workflow information. Such tools come for 'free' with the CWL. CWLviewer is useful for discovering workflows created by other researchers and to find examples of CWL scripts. The bottom line here is that CWL is a very powerful technical solution for generating pipelines that can be shared. It is reasonably simple, and responsibilities are split into three managable pieces. Data inputs are separate from software inputs and software inputs are separated from workflow definitions. The online documentation for CWL is still sparse. For example, to figure out the use of secondaryFiles for bwa I read through a number of existing pipelines on Github. But with the growth of online pipelines, CWL will become stronger and stronger. With this growing support any CWL user will gain the benefit of capturing provenance graphs and other goodies. Beside improving the documentation, I suggest CWL runners add an option for checking determinism (run workflows multiple times and check results), add support for native IPFS (a Python IPFS implementation exists, alternatively IPFS fuse could be used) and add some support for GNU Guix profiles - one single variable pointing in the Guix profile path - so it becomes even easier to create deterministic software deployments that are built from source, transparent and recreatable for eternity (which is a very long time). One interesting development is that IPFS might be integrated with GNU Guix to make it easier to share data, software source tar balls and binary software deployment. Docker has had a good run over the last few years, but with respect to these last two points—transparency and recreatability—Docker really falls short. A Docker image is a binary “blob” and it is impossible to go back from the image alone and see how it was built. This is not transparent. In almost all cases, Docker build instructions include the equivalent of a apt-get update which essentially says the image will end up being different every time you create it. This means it is virtually impossible to recreate an image. The greatest concern, however, is that of trust. Downloading a binary blob over the internet is not a great idea and especially when dealing with privacy concerns. GNU Guix provides a viable alternative in that (1) it is built from source which means a workflow with tools can be audited and considered more secure and (2) provides full transparency, recreatability (read faithful reproducibility). With GNU Guix and CWL you don't need Docker, though it is still possible to run Guix created Docker images that also have these Guix advantages. Another advantage of Guix containers over Docker containers is that they are lighter and therefore faster. Finally, we are working on a workflow language that integrates reproducible software deployment: the Guix Workflow Language, or GWL. This is still work-in-progress but we believe this approach is promising because it is both simpler and more rigorous and can be combined with CWL, and in the future it may write CWL definitions. I am sure I'll introduce a mix of GWL and CWL workflows in my pipelines in the near future. Guix could also benefit from an online repository of channels and pipelines similar to view.commonwl.org. Very useful. Kudo's to the creators. This creates a tar ball which can be loaded into Docker and run - see also my Guix notes. Quite a number of people read the draft of this blog article. I particularly wish to thank Toshiaki Katayama and the Biohackathon in Japan for creating the opportunity to work on this topic; Ludovic Courtès and Ricardo Wurmus of the GNU Guix project for comments and suggestions; Michael Crusoe of the CWL project for comments and suggestions; and Prof. Rob W. Williams for textual edits and overall support.